The enigmatic new play tells the story of Jim, a 90-year-old Liverpudlian who suffers a fall at his home. Drifting in and out of consciousness, memories of Jim’s past come calling as he recalls his time as a young sailor in Norway in World War II, his brief love affair with Else, a free-spirited school-teacher from Oslo, his friendship with cynical radio operator Kenny and his troubled relationship with the father who abandoned him. The play is partly inspired by Nunnery’s late grandfather who served in the Royal Navy’s little-chronicled Nordic campaign during World War II. Fusing live folk music with poetry and new writing, NARVIK is a bold and powerful play about of love, guilt, heroism and betrayal. Set within a small metal frame, which acts as Jim’s Navy boat, Else’s apartment and Jim’s lonely cellar, the action continually shifts backwards and forwards, as flashbacks flesh out Jim’s past a little more. The result is a patchwork of memory and dream, which draws in the audience with its compelling story and haunting music. Joe Shipman is excellent as Jim, handling the transitions between the younger and older man brilliantly and bringing a down-to-earth, likeable quality to the man with a past. Nina Yndis shines as Jim’s Scandinavian sweetheart Else, delivering a strong vocal performance in the musical numbers, as well as a captivating on-stage performance, while Lucas Smith captures Kenny’s slightly edgy false cheer, while also doubling up as Jim’s long-lost father. 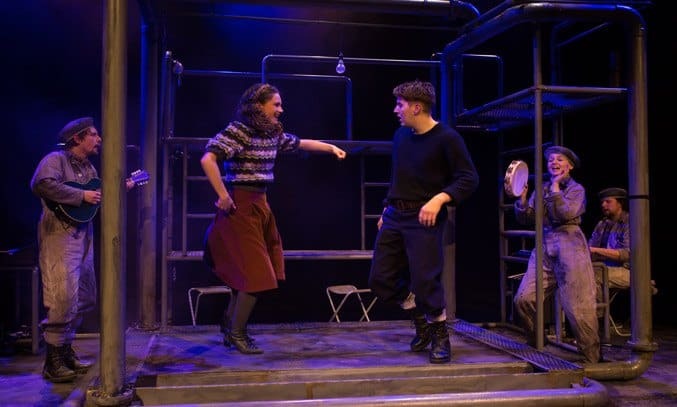 But perhaps the element that makes NARVIK so special is the use of music and sound in the play. It is here that Nunnery truly shows her talent, combining her dual careers as a playwright and a singer-songwriter to deliver a moving, powerful piece which captivates the heart. Beautiful ballads and upbeat sea-shanties contrast starkly against the haunting, atmospheric sounds produced by the cast using pieces of the set. Even musicians Vidar Norheim, Maz O’Connor and Joe Hirons join in the action, acting as modern-day Greek chorus in their ratings uniforms and engine room boiler suits. The only minor criticism is that, at times, NARVIK has a tendency to be too enigmatic for its own good. The sections in which Jim recalls memories of his father is one example of this. While Lucas Smith is excellent in his role both as Kenny and Jim’s father, it’s not always clear which character he is playing at times, particularly as Jim grows older and his memories become more intertwined. That said, once the story starts to unfold, Nunnery’s compelling script and Hannah Tyrrell-Pinder’s innovative direction quickly draw you in and you can’t help but get swept away in the story. A compelling story of love and loss and a thrilling piece of local theatre.